If you've been in the space lately then perhaps you've been the recipient of the warm welcome of Katherine Ferrier. If not, what a treat you are in for! We have a new member of the community, someone whose energy and creativity are boundless, and whose enthusiasm for making, and for A Gathering of Stitches, are infectious. I have been running things by myself for the past two years, and I cannot lie, it may be a bit beyond me. There is a lot of cool stuff going on here, and keeping up with it all is more than one full-time job. Katherine has generously agreed to come on as Studio Manager to help with the physical plant, our community programming, and general creative energy. I am beyond thrilled to have her lovely presence in this venture. I hope that you all take the opportunity to stop by and say hello, and meet this wonderful human for yourselves. Katherine is a force in the world of Making and artistic collaboration, her creative drive and expansive vision are a huge addition to the A Gathering of Stitches community. To begin with, she will be around Monday through Wednesday holding down the fort while I take a short breather. But her fingers are in many pots, she will be part of our retreats, she's helping Adele Ngoy with the Stitcher Training, and there is another long-term project that we are not quite ready to share, that she will be integral to. How's that for a tease? Katherine will be Fairy-Godmother-in-residence for the Open Studios weekends of the 14/15th and 21/22nd of this month. Come do some making and say hello to Katherine this month! Stay tuned for more exciting developments. And in the meantime, read about her road to A Gathering of Stitches below. 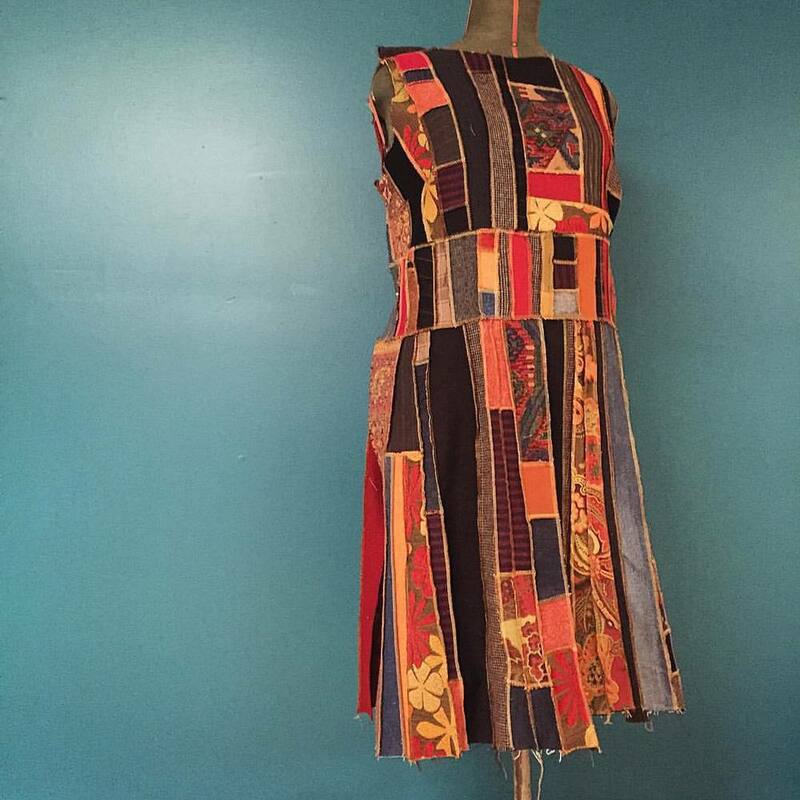 KATHERINE FERRIER is a quiltmaker, poet, dancer, visual artist, educator, curator and community activist who has been immersed in making since the late 80s. She earned a B.A. in Dance/Women’s Studies from Middlebury, and M.F.A. in Dance and Performance from Sarah Lawrence. She’s recently moved to Portland from Bethlehem, NH where she’s been based since 2009. A co-founder of The Architects, an improvisational quartet with a collaborative performance history spanning over 20 years, she is also the founder and Artistic Director of Immediate Theatre, and a founding member of Haiku Analog, both ensembles working with dance-theater-spoken word hybrids. Her creative research is born from the intersections of movement and words, text and textures. A year after moving to Northern New Hampshire from Raleigh, North Carolina, Katherine founded Cultivate, a festival designed to nourish community in Northern New Hampshire through contemporary dance and art. The festival hosts cutting edge dance artists from around the country and abroad, who come to Bethlehem to teach and perform, and immerse themselves in the local community, creating opportunities for North Country audiences to see work and engage with artists otherwise unavailable to them. A year later she founded the Bethlehem Art Walk, a day long festival of art and performance that fills the tiny town of Bethlehem with the work of over 100 artists, artisans and performers and draws visitors from around the region. In 2014 she was the driving force behind the creation and installation of a 22 by 10 foot “Welcome to Bethlehem” mural comprised of over 200 panels, each painted by a different member of the community. The mural is installed on the side of WREN’s Local Works Marketplace and is highly visible while driving down Rt. 302, inspiring many tourists and passers-by to stop and linger in Bethlehem. She has devoted her professional life to fostering situations in which people can experience the transformational power of creativity, collaboration and community. A juried member of the New Hampshire State Council Artist Roster, she offers residencies and experiential workshops in both dance and writing throughout the country. She designed and facilities WREN’s “Business of Art” curriculum for artists and entrepreneurs, offering artists practical training in a comprehensive variety of topics including: publicity, promotion, pricing and selling one’s work. She believes art-making and collaboration are our most powerful tools for creating and nourishing all aspects of community and creating positive social change. Katherine has been instrumental in organizing art and cultural events throughout the North Country, including the Bethlehem ArtWalk and Cultivate, a festival designed to enliven community through contemporary dance and art in Northern New Hampshire. In recognition of all she has done for the arts and artists of the North Country, she was recently named the 2016 NH Arts Advocate of the Year by NH Citizens for the Arts. Combining her love of writing and making, Ferrier developed Thread, a trendsetting on-demand typewriter poetry practice into a successful wedding industry business. 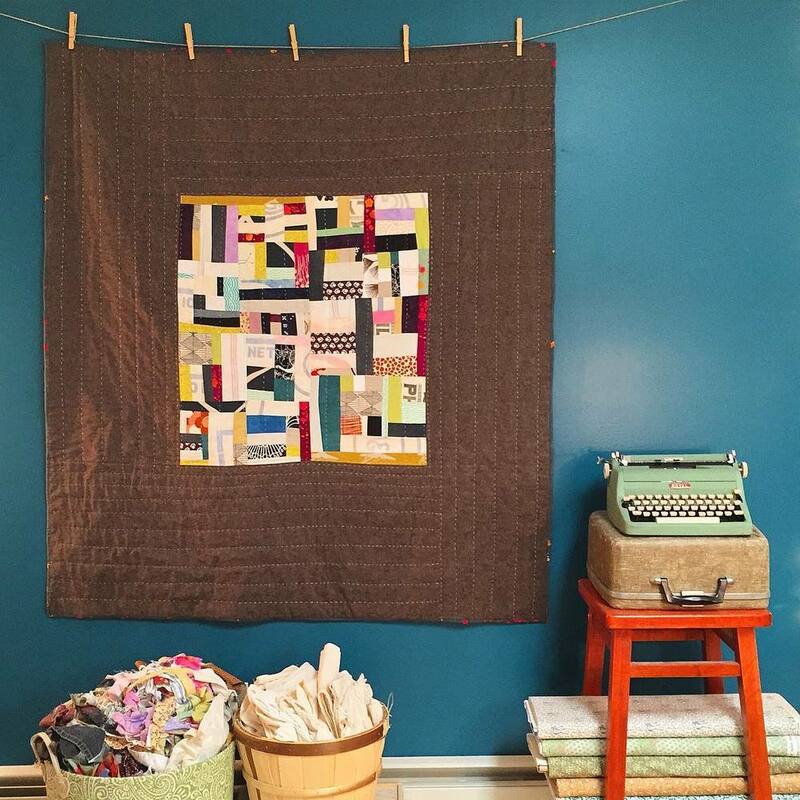 Featured twice in The Knot, and regularly in North Country publications, she has written hundreds of spontaneous on-demand poems at weddings, art openings, reunions and other special events, and creates one-of-a-kind heirloom quilts. Katherine is eager to dive into the creative communities she has long been drawn to in Portland, and is thrilled to have found a home at A Gathering of Stitches.